The Magic of Elvis - Don Obusek's Tribute to"The King"
WELCOME For More Information or to Book Your Event, Contact Us! 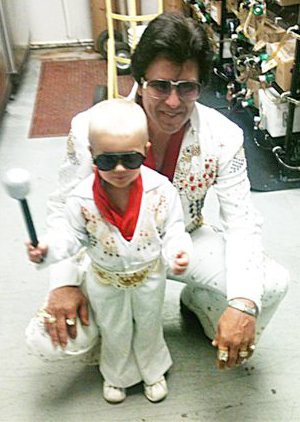 A new generation of Elvis fans is born! This is a picture of Don and our grandson, John. (John is our son Nick's son). At the time of our 2012 show, John was 3 years old. I bought his 'mini-Elvis' jumpsuit from Graceland. Before the start of the show, he came out onstage with me and the audience thought he was adorable! This was a spur-of-the-moment decision for John to appear, so there was no time to have him learn any 'Elvis' moves, but, with Don as his grandpap, John is showing signs of musical talent - a new generation of Elvis fans is born! John thought that he and his grandpap were 'super heroes'! Click here for more photos of the 2012 35th Elvis Anniversary Show at Pepsi Roadhouse. Click here for photos of our 2007 Bahamas Cruise, with our special guest, Kathy Westmoreland! Don is a powerful and dynamic entertainer and he is the ultimate professional. He has “the looks”, “the voice”, “the moves” and “the magic”! He is extremely personable in his own right and adds his own charisma to the show. Don has a strong reputation for excellence and his unparalleled professionalism is second to none. We have many years of experience and are very reliable and dependable. Many of our engagements are repeat performances. At the start of a show, the opening strains of 2001 are heard. Your heart starts to pound in anticipation, and you can feel the energy and excitement of a “live Elvis tribute show”! ‘THE MAGIC OF ELVIS’ tribute show does not contain illusions or tricks. Rather, the “magic” comes from the fact that after more than 41 years, the love and admiration for Elvis continues and is reaching out to new generations of fans. 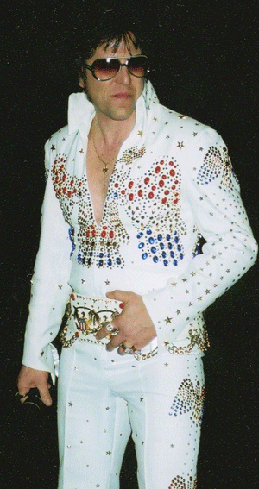 There has only been, and there will only ever be, one Elvis, and he is as popular today as he was back in the 70’s. He had a certain “mystique” or “magic” about him, and that “magic” is still alive today, due to his fans and through quality tribute artists, such as Don. Some “Elvis Tribute Artists” (ETA’s) actually claim they are “better than Elvis” – it is amazing that they would think such a thing! Make no mistake – Don does not think he is Elvis – he only tries to pay tribute to the world’s greatest entertainer, and keep the magic and the memories alive in a good and positive way. It’s been said of the ‘Elvis Phenomenon’ “if you are an Elvis fan, no explanation is necessary. If you’re not an Elvis fan, no explanation is possible”! Don’s outstanding tribute to the world’s greatest entertainer helps the “MAGIC OF ELVIS” to live on. Fans of all ages and lifestyles enjoy Don’s quality, high energy Vegas-style tribute. Please keep our show in mind for any entertainment needs (including advertising, commercials and promotional events, etc.). We will make your next event one to remember! If you encounter any difficulty as you view the site, please contact the webmaster so we may correct the problem. Thank you.